During February, Stephen mentioned to me that Schick had a promotion in facebook where they would send you one of their latest razors if you liked them. After receiving their latest Schick Hydro 5, I wrote that I thought it was the best mens razor that I’d ever used. Shortly after that, Sam from Shave Shack got in contact with me and asked if I’d review their latest arrival – a luxury shaving cream from the United Kingdom named Bluebeards Revenge. I was really excited to hear from Sam, he is a local Gold Coast small business owner and his shaving shop sells boutique, luxury shaving products that the major players ignore – which I think is great. The first thing that I noticed about Bluebeards Revenge was the kick arse box that it came in. 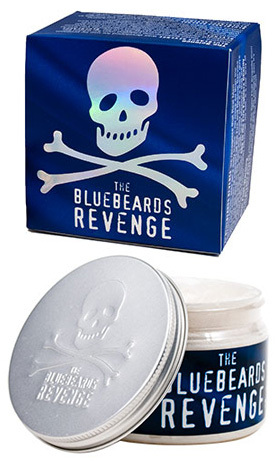 Instead of some puncy pretty boy container, Bluebeards Revenge comes in a simple blue cardboard box with their signature skull & crossbones stamped on the lid. Around the box, instead of the typical ‘you should use us because we are the best’ – they instead inform their prospective clients that it is a shaving cream for real men and that wimps need not apply. Unboxing the Bluebeards Revenge reveals a clear plastic container with a metal lid, to give it that nice solid manly feeling. The shaving cream has a great fragrance and looks silky & luscious in the container. It only takes two finger fulls of Bluebeards Revenge shaving cream to lather up in your hands to cover your face. I’ve seen other people use it with a shaving brush & shaving bowl and only use an almond sized amount to produce a beautifully thick shaving lather – so I might need to invest on some of those to experience it to its fullest effect. Once applied, the shaving cream provides nice protection for your face and my Schick Hydro 5 that I was provided via facebook works with it really well. I’ve noticed that I’m getting very little shaving rash with the new razor and Bluebeards Revenge which is great and it produces a very clean shave. One thing I really like about it is that once you’ve run the razor over your face once, you can put a small amount of water into your hands and re-lather your face to tidy up any bits that you missed in pass one. After you’ve finished shaving with Bluebeards Revenge, it washes off your face easily with a little water. I particularly liked that it doesn’t leave any residue on your skin either, comes off cleanly and your face feels smooth, clean & refreshed. I haven’t been using it long enough to notice it just yet but it also contains Decelerine, which is meant to slow down beard growth as well – handy if you’re particularly hairy. Overall I think the Bluebeards Revenge Shaving Cream is a great product. I love that it has attitude and isn’t another sterile product that you’re so accustomed to in the supermarkets. I like the scent, it goes on well, assists with a really clean shave and doesn’t leave a mess. Now I just need to sort out a badger hair shaving brush & a shaving bowl!